You might have driven past this cafe on Queens Rd hundreds of times (as I had), and still have no clue Everton Hills is hiding such a lovely cafe. But tucked behind the IGA and the chemist is this beauty. Despite being on a busy road the cafe provides a leafy oasis. A tall garden shields you from the car park, and a balcony offers views to trees below. Being on top of one of the hills giving the district its name allows access to a refreshing breeze if you sit outside. The covered outdoor area is roomy with miles of space between tables. There's an inside seating option too, with striking geometric-patterned wallpaper and funky lightshades. It would be a terrific venue for a casual function. But for parents, one of the best features of this cafe's setup is the play area. 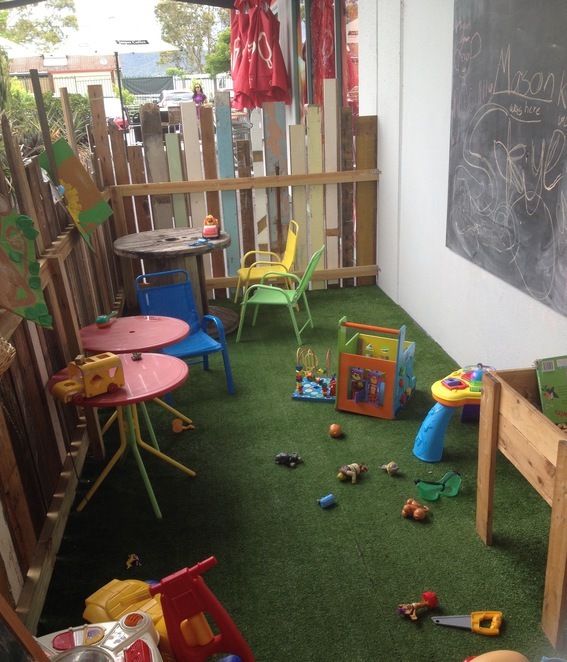 It's bordered by a recycled timber fence, with astro turf underfoot, and a good number of toys and books. It keeps our little one occupied for longer than most other cafes with toys, so you can actually savour a coffee, not scull it. Plus there are high chairs and ample room for strollers. The Colombian-influenced menu has lots of healthy choices plus some indulgent ones for balance. On our last visit our nutritious choice was the Green Bamboo Bowl - blended with kiwi, spinach, apple, banana plus South American feijoa and lulo fruits, and topped with granola. We also enjoyed a "healthy if you pretend" banana bread with chocolate and walnuts, and a rich chocolate brownie. I guessed the brownie contained about 99% chocolate, a little much even for chocoholics. My only disappointment is that Birds & Bees is like many local cafes in that going there later in the afternoon or on Sundays is not an option. The relaxed vibes flow from 6am to 3pm on weekdays, and 6am to 2pm on Saturdays.